This isn’t the first time I’ve had to spend time waiting for a loved one in a waiting room while they undergo a major surgery. And the feeling of hopelessness is almost always apparent as everyone waits for the surgeon to come out and deliver the outcome. Anxiety and self-reflection often follow this feeling of hopelessness as we try to find solace and comfort in each other. We almost always put our faith in the almighty, praying often and asking priests to provide blessings for the sick. We become overly spiritual in times like these and would be nice if we kept this level of enthusiasm regularly. It is understandable however and in addition to our increased spirituality, we also question our own mortality. We ask what we would do differently in our lives to avoid the same fate. We promise to take better care of our health, to exercise more often, to eat well, to get a health checkup more often, to love and take risks, to have no regrets, and more importantly, to be at peace with ourselves. 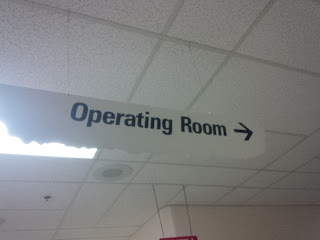 My mother is the one undergoing an operation right now. She has a heart disease, a penetrating ulcer in her aorta. The doctors say it’s like a “ticking time-bomb” just waiting to go off so a second open-heart surgery is her best option. Her first open-heart surgery was in 2009 to bypass some blocked arteries and two years ago to insert stents on some smaller arteries. She also has renal failure and has been on dialysis now for 8 years so she is no stranger to hospitals. These two diseases and her frail body make for a very risky surgery. The medical team however is very good and I have full confidence in their skills. When combined with my mother’s mental will to live, it improves the statistics significantly that this will be a very successful operation. The anesthesiologist or the “sleep doctor” explained the procedure earlier in the day when we dropped my mother off in the operating room. He said the he will be putting the sleeping agents intravenously and then she will be asleep at that point. Then, he will insert tubes through the veins on her neck to monitor her heart. He will also use a ventilator to help her with her breathing. 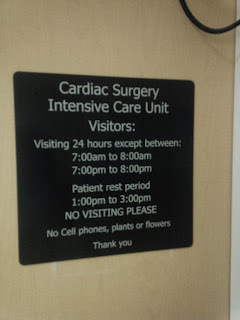 This whole process should take an hour up to 2:15 pm at which points the cardiologist comes in to start lowering her body temperature, open up her ribcage, connect her to a heart-lung machine, and to prepare her for the actual operation. The preparation should take 3 hours to complete he said, bringing us to about 5:15 pm before the actual operation takes place. The patching of her aorta only takes 45 minutes to complete and the doctor said that they will use cow pericardium for the patch. That means that they will be done by around 7 pm. If they have to they will also redo the bypass work done 4 years ago which will delay the work. We may be looking at about 11 pm before we hear anything. After that, she will be moved to the ICU to lower her body temperature back to normal but will probably still be heavily sedated and may even be in a medically-induced coma. The doctor said that whenever the body is cooled and then warmed, liters of blood transfusion is required. I know I'll be donating blood when all this is over. It’s 10:45 pm before the surgeon walks out of the operating room to tell as the good news. He said with a smile (and a can of coke for his sugar high) that everything went according to plan. They were able to stitch the cow pericardium around the calcified parts of her aorta and seal off the ulcer, which he said has grown to the size of a quarter. They gave her plenty of blood, about 5 liters and only time will tell if there’s any bleeding after her body is warmed to normal levels. He said that they will be moving her to the ICU now and we will be able to see her in a bit. It's 12:15am before the ICU nurse let's us into the ward to see my mother. The ICU nurse just finished taking blood samples and she said that everything looked good. She was still hooked up to ventilation machines which the nurse will be removing around 3 am and will be examining my mother for any brain damage. She said that anyone who goes through an 8 hour operation like this could have side-effects, possibly caused by stroke, etc. The nurse will know more when she wakes up my mother. We have all left the hospital now and will likely be back to see her in the morning for more news. The first part is done now and we can expect her recovery to take some time. We will no doubt be spending more time in the waiting room which is looking a little bit more inviting and passable to me now. Take your mother some real food. the stuff served in most hospitals is horrible. familiar foods well prepared will do wonders for her cheerfulness and will help her heal more quickly. I was in Royal Jubilee.Hospital in Victoria, all the food came from Calgary.